As an affiliate of Amazon.com we have brought together this list of books about tattoos and tattooing. Looking for more information on tattoos? Maybe another book to add to your collection? Just curious? Click on a title to be taken to Amazon's web site where you will get a complete description of the book. Purchases are done directly through Amazon.com and are Guaranteed 100% Safe! Happy reading! A complete reference guide for body artists, illustrating the essential techniques of tattoo art and providing stylish designs on a range of subjects, many of them accompanied by photographs showing how the design translates to the skin. The designs provided include classic tattoo motifs such as flowers, hearts, butterflies, stars and zodiac symbols alongside contemporary favourites such as Japanese kanji characters. The result is a complete guide to the art of tattooing as well as a rich source of over 200 designs suitable for tattoos. A must for anyone interested in the subject. The artistic versatility of tattoo artists has frequently been overshadowed by the negativity that surrounds tattooing in general. Many tattoos are made by would-be artists who copy overused designs. A perfectly tattooed body requires the skills of a professional and talented artist, who creates a unique and personal design. These designs are often inspired by one or more of the various tattoo styles of Japanese, Maori or other tribal origin. "The Sketchbook" offers the reader a selection of 80 of these unique designs by well-known and less famous, but very promising, tattoo artists from around the world. Each artist was requested to create a sketch unrestrained by commercial demands and which reflects their own personal motivations. Dedicated By Blood is the result of four years of intensive collaboration between Steur and Hatfield. Their shared passion for the Maori culture resulted in beautiful photographs that not only uncover the soul of Ta Moko, but also the pride of a clan intimately revealing the artistry and essence of Gordon’s designs. The body became the ‘wood’ for the artist and a symbol of the history of the clan and culture. This book reflects the renaissance of the Maori culture through the meaning of Ta Moko. Tattoos continue to move into the mainstream and grow in popularity with each passing day. For people contemplating getting a tattoo, however, the choice of images can be overwhelming. A comprehensive, informative exploration of the colorful world of tattoos, The Tattoo Encyclopedia presents concise descriptions of symbols both common and unusual and sheds light on their historic, religious, and cultural significance. The British Columbia Indian Language Project is directed by ethnographer/linguist Randy Bouchard and socio-cultural anthropologist Dr. Dorothy Kennedy. Traditional tattooing designs are depicted from the exotic Pacific Polynesian cultures of Easter Island, Hawaii, the Marquesas, New Zealand, Samoa, Tahiti and Tonga. The actual process and ceremonies involved in tattooing are described and illustrated with over 250 drawings and color illustrations of native people. Included are actual 19th century photographs as well as early exploration art, paintings, drawings, engravings, and artifacts all relating to tattooing. Madame Chinchilla has written an historically significant book on women tattoo artists. Another great book by Madame Chinchilla the author of "Stewed, Screwed & Tattooed". A MUST read for anyone interested in tattooing. A historical/contemporary collection of black and white portraits of male tattoo artists worldwide. Each artist has a personal statement about their love of the art of tattoo. "...anyone who can cajole the icon of American tattooing, Lyle Tuttle, to pose in the buff must have persuasive powers..."
The Tattoo History Source Book is an exhaustingly thorough, lavishly illustrated collection of historical records of tattooing throughout the world, from ancient times to the present. Collected together in one place, for the first time, are texts by explorers, journalists, physicians, psychiatrists, anthropologists, scholars, novelists, criminologists, and tattoo artists. A brief essay by Gilbert sets each chapter in an historical context. Topics covered include the first written records of tattooing by Greek and Roman authors; the dispersal of tattoo designs and techniques throughout Polynesia; the discovery of Polynesian tattooing by European explorers; Japanese tattooing; the first 19th-century European and American tattoo artists; tattooed British royalty; the invention of the tattooing machine; and tattooing in the circus. The anthology concludes with essays by four prominent contemporary tattoo artists: Tricia Allen, Chuck Eldridge, Lyle Tuttle, and Don Ed Hardy. The art of decorating the body with tattoos dates back as early as the Ice Age. Although the use of tattoos among indigenous peoples is waning, the practice lives on, as more and more people around the world discover body art. Peoples from Central Asia and America, tribes and nomads from North Africa and the Middle East, and the Australian Aborigines and Maoris have a long tradition of practicing this art. Each design in this pack is unique and carries its own special meaning, whether as religious symbol, talisman, charm, indicator of status or position, or simply an adornment. The meanings and myths behind the patterns are clearly explained in the history of this fascinating art. Tattoo Art Books are your #1 choice when it comes to high quality tattoo designs. 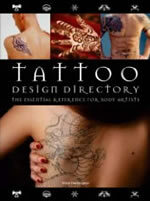 Tattoo Art Books are used by professional tattoo artists worldwide. If quality and variety are what you need, turn to the tattoo designs used by the pro's - Tattoo Art Books. The Return of the Tribal attempts to look at all types of body adornment from tribal to urban, from piercing to body painting, from scarification to tattoos, and from genital mutilation to structural modifications of the ears, legs & neck. And it does so with a cornucopia of full-color photos presented alongside a very readable text. This may well be the best book of its kind currently available. The most comprehensive book yet on this unique art form. Whether flaunted or hidden, sought as art or curiosity, the tattoo has left its mark on generations. From its beginnings as a pagan ornament to today's popular body art, this book takes an intriguing look at the world of tattoos. 150 photos. The book's 72 portraits form a compelling, haunting, vulnerable, frightened, beautiful, defiant mix. From Native American designs to bikers' insignias, this one-of-kind collection of photographs features work done by more than 25 of the world's top tattoo artists in over 250 archival and commissioned photos. This nostalgic collection of early American tattoo art will charm collectors, artists, and the ever-growing tattoo audience. Tracing the history of tattoos in the U.S. through biographies of tattoo artists and featuring stunning, full-color illustrations of the works themselves--also known as "flash"--this gorgeous ArtBox details the unique style of the classic American tattoo. 35 full-color and b&w images. 15 postcards of "flash." 3 temporary tattoos. Decorated box. Bodies of Subversion is a comprehensive and clear-eyed account of tattooing and women in Western society over the past century. Margot Mifflin furthers understanding of this complex art as it exists among women. It is essential reading for anyone interested in the subject. Although the book can come across as too specialized for the average reader, New York City Tattoo does unearth and preserve an alluringly gritty chunk of postwar, pre-hippie New York history. Nearly 40 years ago, the author gave up his career as an English professor to become a tattoo artist. At the urging of his friend Dr. Alfred Kinsey, he kept a daily journal for many years about his experiences, from which this anecdotal analysis is derived. Annotation copyright Book News, Inc. Portland, Or. Between 1940 and 1973, Norman Sailor Jerry Collins became known as the greatest practitioner of classic American tattooing. His masterful designs-featuring ships and beautiful girls, eagles, hearts, roses, and other now-familiar motifs-were widely imitated but rarely matched for boldness, elegance, and clarity. This wonderful collection of Sailor Jerry's own working patterns, known as flash art, is a treasure trove for tattoo fans as well as students of Americana and folk art. Each sheet of flash art is reproduced in full size in order to show the subtleties of detail and shading for which Collins was renowned. As today's tattoo renaissance spreads, there is a fast-growing appreciation of the artistic and cultural value of traditional designs like Sailor Jerry's-a fact to which Sailor Jerry Tattoo Flash is a surprisingly beautiful and wit-laced testament. "...intriguing insights from a woman tattooists viewpoint on social stigmas and the spiritual nature of tattoo art." The New York Times called "Modern Primitives" "the Bible of the underground tattooing and body piercing movement." Crammed with illustrations and information, it's now considered a classic that thoroughly investigates ancient human decoration practices such as tattooing, piercing, scarification and more. Color Full Pain: Tattoo Piercing is an amazing portfolio of black and white photographs, Walter Kehr documents one of the strangest fads to sweep through the contemporary American counter-culture -- body piercing and tattooing. Practices normally associated with primitive cultures, body piercing combined with tattooing has taken on aspects of social protest and the "body-as-art". Warning: Kehr's Color Full Of Pain is not for the squeamish. University of Missouri, Columbia. Second edition of a presentation of the author's theory on the acts of self-mutilation, for therapists. Previous edition 1987. Discusses the relationship between the act of self-injury and self-healing. Softcover. Presenting tattoos as fine art, with an ancient history. In prison, the tattoo stakes a claim to individuality. In Prison Tattoos, Douglas Hall Kent uses his camera as a sociologist's tool, photographing inmates from America's prisons whose tattoos, professionally done and homemade, indelibly imprint on their bodies what these men desire in their souls: autonomy and identity. The re-issue of Lea Vergine's groundbreaking text on Body Art, with a new introduction. When it appeared in 1974, it was the first book to witness the birth and growth of one of the most singular and controversial artistic manifestations of our century, Body Art. The book contains Lea Vergine's thoughtful insight on the golden age of the Body Art movement, the magic Seventies, and several writings by the artists themselves. In recent years, appreciation for tattoo art has soared, from the discovery of a 5000 year-old tattooed mummy to its acceptance within an art world increasingly intertwined with pop culture. Determined to be a tattoo artist at the age of ten and tattooing professionally since 1967, California native Don Ed Hardy has become one of the world's leading tattoo artists. Inspired by traditional Japanese work, he was instrumental in developing the medium's fine art potential and fueling the late-century international tattoo boom. Tattooing the Invisible Man presents a survey of Hardy's paintings, etchings, lithographs, drawings, photographs, and elaborate tattoos, over 500 color illustrations, most never before published. Chronicling a uniquely extreme self-expression that encompasses Asian aesthetics, Western art history, surfing, hot rod art, and California funk, this exhibition catalogue will appeal to a wide-ranging audience, and will be an important addition to the printed history of the tattoo. An detailed look at tribal tattoo designs. Illustrated with historical images collected by early explorers and observers. Book has some background text but the images and drawings are the main focus of this work. The main focus of this awesome book IS tattoos, but most of the people also have body piercing and are generally what mainstream society would consider unconventional-looking, to say the least. The pictures are very pure-in a studio with a white background (except for a few in tattoo parlors), lighting that is very stark, simple and non-fussy. It's a very kind of low-key, classy, subtle technique, and it works BEAUTIFULLY here. You really get a sense of these people's personalities, without any distracting over-production/direction... The best tattoo-photography book I'VE ever seen...and I'm obsessed with them, I've seen just about ALL of 'em. BUY THIS BOOK. It's a stunner. Are you interested in Japanese tattoos? yes? Then this book is definitely for you! The photographs are great. and the tattoos on display are all done by some of the greatest Japanese tattoo masters. the introduction I found rather bad; very artsy fartsy. but it's only a bit more than a page long. so don't worry. The complementary text Sandi Fellman has written I haven't even read yet - I've been way too busy looking over and over again at the tattoos. Again: if you're into tattoos and/or Japanese tattoos you simply have to buy this book! Gives information needed to make an informed decision about body modification including the laws and safety regulations surrounding this business.